My route for the TGO Challenge 2017 has now been vetted and signed off, and quite unexpectedly there was no need for any changes or alterations. Approved without a hitch. So here’s a quick run down of the intended trek. I’ll be starting from Oban this year, and planning to cover about 362 km and a little over 17,000 m of ascent. There are also a few Munros planned in along the way, about 25 or so. That’s pretty much the same as my last challenge in 2015, though on this occasion I’m splitting it over 15 days and aiming to finish on the Friday lunchtime somewhere near Doonie Point, a stones throw north of Stonehaven. I’ve listed the main stats compared to my previous routes at the end of this post, but to start here’s the basic plan, which as ever is highly likely to alter depending on the weather. Note : Clicking on the maps should take you to the full detailed map on my Social Hiking page. Day 1 will take the usual easy start through Glen Lonan to Tynauilt. From there I head along Loch Etive for only a couple of km, leaving the loch-side to camp high on the first night and set myself up for the next day over Ben Chruachan. I’m keeping the more normal route along Loch Etive and into Glen Kinglass in my back pocket as my FWA over days 2 & 3. Day 2, weather permitting, I’ll be heading over the Ben Chuachan Hills, dropping down momentarily to the Lairig Noe half way along but climbing straight back out again, hopefully bagging 4 munros along the way before finally droping down into Glen Kinglass to camp. Day 3 starts with a rather steep climb up Beinn nan Aighenan before a high level traverse over the Ben Starav Hills as far as Coire nan Cnamh for another high camp. Day 4 continues along the ridges of the Clachlet traverse (Black Mount) before finally dropping down to Glen Coe for a pint at Kings House Hotel. A short amble from there and hopefully by the end of Day 4 I’ll be camped somewhere at the foot of the Devil’s Staircase ready for the next leg. So that’s 11 munros over the first 4 days. And if the weather is not too good, my FWA route takes me along Loch Etive and into Glen Kinglass as far as Loch Duchard, before sneaking back over Coire nan Cnamh, dropping down to Glen Etive again and then taking the Lairig Gartain to Glen Coe. Who knows, if the weather clears up again I may even pop along the Buachaille Etive Mor ridge as an alternative. Plenty of options. Day 5 is an short day, giving me a bit of slack if the first leg from Oban takes longer than planned. I’ll follow the West Highland Way over to Kinlochleven where I plan to restock with food, hopefully get a slap up lunch at a pub, and then climb out of the valley in the afternoon and camp in the east end of the Mamores somewhere high above Loch Eilde Mor. Day 6, if the weather permits, will be over Beinneinn Mor then dropping down to the Amhainn Rath and following the river east to Loch Trieg in time for a late lunch. From there I’ll head for Loch Ossian and camp somewhere towards the east end. Day 7 will take me over the munros around Aonach Beag, dropping down on the north side to cross the An Lairig watershed before skirting high above Loch a Bhealaich Leamhain and dropping down to Lochan Na H-Earba to camp. There are a couple of additional tops along the way should time permit. Day 8 starts easy enough, through the forest to Loch Laggan, then through Glen Shirra to the River Spey near Garva Bridge. But it’s only a brief respite as the route then heads up Geal Charn, and into the Eastern Monadh Liath. Hopefully I’ll have a high camp near Lochan Uisge, before dropping down to Kingussie on the morning of Day 9. Day 9 be the second of my shorter days and gives me a chance to clean up and relax in Kingussie before a push through the Cairngorms. Who knows, I may even treat myself to a B&B, I will need it after 9 days. 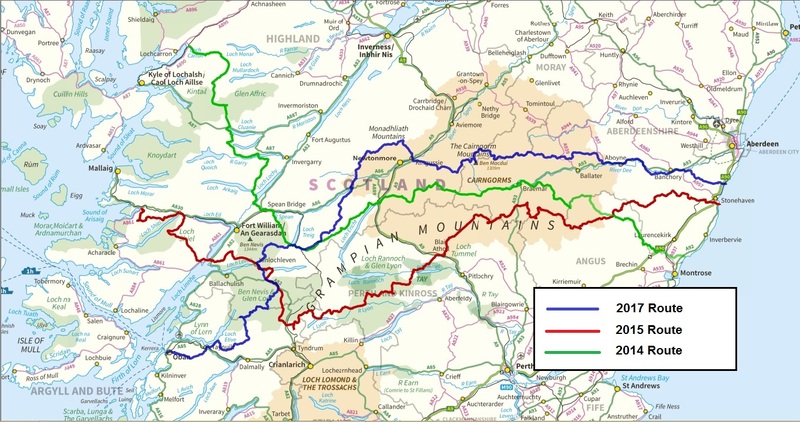 The FWA over this stretch breaks away east before Loch Laggan and heads east via Lochan na Doire-Uaine, skirting north of Dalwhinnie to Loch Cuiach for a camp, and then continues the next day over to General Wades Military Road which I can follow to Kingussie. Day 10 will start by heading across to Glen Feshie for the briefest of visits, before climbing out along the Allt Fhearnagan to trek over Carn Ban Mor and Tom Dubh for a high camp at Wells of Dee. There are a couple of munros close by if a fancy an evening stroll from the tent. If one day really worries me it’s Day 11, which starts with the rather daft idea of making straight across the Lairig Ghru by descending directly from Braeriach to Pools of Dee at the high point of the Lairig Ghru, and then attempting to burn my calves into oblivion by climbing straight up the other side to make for Ben Macdui. It looks rather steep. so let’s see how practical that turns out to be. From Ben Macdui I’ll double back and be heading across the plateau to Cairn Gorm before descending to the Saddle to camp at the Fords of Avon Refuge. Day 12 continues the high theme by crossing the Fords of Avon and climbing up to Beinn a Chaorainn, then picking off the munros heading east over Ben Avon and on down to Lochbuilg Lodge. I plan to camp somewhere along the River Gairn, hopefully making it as far as Tullochmacarrick. There’s a tangle of FWA’s over these few days, weaving their way around the Cairngorm plateau so that on any day I still have the option of going high again. Day 13 sees things finally easing off as I head out of the mountains and down to Aboyne where I’ll pick up the Deeside Way. After 4 days across the Cairngorms I’ll be looking forward to a shower at the Loch of Aboyne campsite. I’ll use the Deeside Way as my route for the best part of Day 14 through Banchory, leaving it at Crathes to seek out a last nights camp on the Durris Forest. Days 13 & 14 are quite long, 35-40 km each, but hopefully by now I’ll be motoring. And besides, the ascent is almost nothing, about 600m each day. The final Day 15 will be a thankfully short affair, up through the Durris forest and through the small windfarm on Meikle Carewe Hill and Curlethney Hill, before heading finally to the coast for a finish at Doonie Point. This should be a lovely end to the trek with a short walk up the coast via Grim Brigs to the café a Muchalls for a cuppa. And I have Ian Sommerville’s blog post about the Magnificent Muchalls to thank for the idea of finishing here; It looks superb. So there we have it. Needless to say I’ll need a good run with the weather if I’m to do even half the main route, but if the weather doesn’t play fair then the FWA’s offer a fine alternative route and there’s plenty of scope for picking up additional tops later on if weather forces me to drop some along the way. Finally, here’s how the route compares to my previous TGO’s. Even though the mileage and ascent are pretty similar to my last Challenge n 2015, by taking the additional day and building in a couple of shorter days I’ve managed to reduce the daily mileage and ascent a little. It’ll give me a fighting chance. All I need to do now is get fit, and pray to the weather gods. Oh and there’s the usual dilemma with a high route of deciding whether to pack the walking axe and spikes, and choosing which tent would be best for the numerous high camps. I’m actually quite surprised that the vetter approved it without alteration as one FWA involves a camp at almost 700m at the end, and another FWA goes to over 800m. But I guess both are actually reasonably safe so long as I keep options open. Main problem yet again is that I don’t have a chance to shower and clean up until the end of day 9. I’m going to be pretty pungent by then. Very impressed with your route John. Cheers Alan. I had four different routes planned out, each from different starting points but settled on this one. Hoping for a good spell of weather for days 2-4 so I can have a good crack at the high ground over to Glen Coe. As I was reading your route, I started to see those intensely bright spots floating in my vision, and my nose started bleeding. Just a warning. That’s all. You may have just given my wife all the incentive she needs to start vetting my routes herself. Home repairs require that my knees be in full working order until I receive that telegram from Her Majesty. ‘Uncle Bad Boy’ however has a certain ring to it, and in the absence of a TGO trail name (and on the understanding that it’s not used in polite company) I could live with that. Blimey! Do you have three Weetabix for breakfast? Call it a mid life crisis Robin. My head refuses to admit that the flesh is weakening. Recent Hill walks would say otherwise however. Weetabix is not a bad idea though, they’re very light if nothing else. I will guarantee May is going to be a really glorious month of fine weather and gentle breezes. Just can’t guarantee where. Good luck, it looks an amazing route, added you to my blogroll, can’t wait to read aboutyur adventure, but it will have to wait till after my PW. Thanks Andy. Hopefully those gentle breezes will be shared between Scotland and the Pennines so we can both enjoy our adventures. I must admit whenever I read about somebody heading out on the Pennine Way, I just want to do it again. I always read your plans with admiration. Well done for picking a route that got past the vetters without change! Look forward to following you as a ‘virtual’ trekker. Thanks Ruth. If I were being honest with myself I think youthful energy may now be starting to wane after reaching the half century milestone, so perhaps my plans are now beginning to outstrip my endurance. I’ve just spent a couple of days backpacking in southern Snowdonia and it was a bit more of a struggle than it used to be. Much will be down to the weather in May, but I would be very surprised if the whole route panned out as planned. This is the ‘before’ report, I think. How did it go? I’m planning the walk from Oban, and having trouble getting those mountains in without making too twisty and challenging. So I was shocked to see your map including those I’ve been looking at just now. Are you still alive? I don’t seem to be able to find a post since May 12th. If you are there any comments about the route in execution would be welcome! Hi Paul, yes I’m afraid that due to family circumstances my Blog has taken a back seat this year so I didn’t get around to writing up the actual crossing. In short I suffered a bad chest infection in the week leading up to the TGO and almost pulled out, but travelled up to Oban with the intent of starting slow and seeing how it went. The first day as far as Loch Etive was fine, but as soon as I started the evening climb to camp up to the Cruachan range to camp at Meall Copagach it was clear I wasn’t well and there was no way I was going to pack in the munros from there through to Glen Coe. So I camped high that night and the next morning retraced back down to the loch and followed my FWA round into Glen Kinglas. In the end I walked on through to camp at Loch Duchard that evening, and the next day ascended from Clashgour to Shron Ghearrain (lovely walk through the Glen). So in effect I cut out the Cruachan and Ben Starav munros and picked up the route later on. Just taking that extra day to recover did the world of good, and from there on I completed the route to the East coast as I’d planned and packed in a fair number of tops along the way. The route in the end was quite long, 426 km, but I finished a day ahead of my plan due to cutting out the earlier tops. Looking up at the planned route as I passed through Glen Kinglass it actually looked like it would have been challenge even fully fit. I think I’d have been pushed in the time I’d allowed. And some of the ascents looked extremely rough. Ascending up from Loch Etive on Cruachan was very hard going, and the ascent into the Ben Starav range from Glen Kinglass looked equally exhausting. And of course the problem with a twisring high level route is that your FWA’s tend to cut corners and be shorter. So if you take an FWA it’s very easy to get out of synch and either have to camp very early and sit it out in the hope of picking up the next day’s high route as planned, or cut out 2 high days with a single longer FWA. My planned route for the first few days was a bit a**e about face, with long high days and short easy FWA’s. If I were to do it again I would either plan in the Cruachan range, or Ben Starav range….but probably not both. You’re right about the challenge of starting on rough and high routes, but unfortunately that’s how the TGO works going as it does from West to East. I have always been a bit too ambitious at the start and then suffered as a result. I was in Scotland in October – with a route plan for a ‘high’ first half of the Cape Wrath Trail. Short days and bad weather prevented me going up high and as a result I was in unusually fine shape the whole trip! But also had a couple of spare days to fill. I agree bout the either / or in your last sentence, to. Nice photos too. Thanks for sharing! I should have learnt after the first day on my 2015 crossing starting at Lochailort. That year I did the entire Moidart corbetts on the first day with a ridiculous amount of ascent. Finished the day exhausted and almost unable to eat. But when you’re sat at home planning these adventures from the comfort of your centrally heated home, these big hill days just look enticing.